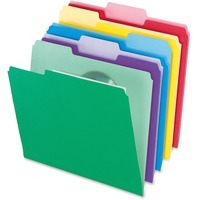 Pendaflex File Folders with Infopockets PFX02086 $9.49 Inside infopockets securely hold CDs, photos, notes, important messages and other small items. Lighter color interiors help prevent misfiles. 11 point stock features 13 cut tabs in three different positions for easy access to your files.